When will we recognize the danger of falling vases to eye safety? In the case of the restraining order that his second ex-wife Jennifer Willoughby filed against him for allegedly breaking into their house with his fist, Porter said that he was merely tapping the glass pane with his index finger, according to the two people with knowledge of what he shared with senior staff. Porter said he and Willoughby were separated at the time. He returned to the house to collect his clothes, and while tapping the glass door pane with his index finger, his knuckle went through the glass. Porter said he went into the house to wrap up the wound but Willoughby told him to leave, and then she called the police. She said that he punched through the door with his fist, according to a criminal complaint reviewed by ABC News. So embarrassing! I hate it when I put my knuckle through a glass door when I'm tapping on it! So inconvenient! Why can't we make glass doors stronger than that? And so many people get black eyes (yes, mostly women! How clumsy women are!) when they walk into a door or lunge for a falling vase! 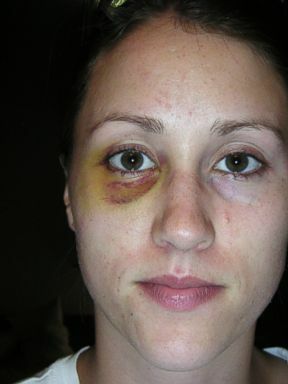 Porter told senior staffers his first ex-wife, Colbie Holderness, received a black eye and facial bruises during an argument as the two struggled over a Venetian glass vase in their hotel room while on vacation in Venice in the early 2000s after they were married. He said that “[Holderness] was ready to throw glass onto the floor to smash and they both lunged for the glass and there was a struggle,” according to two people with knowledge of the account. Porter went on to say that she bruised her eye when she fell during their struggle and denied punching her. He also said that the was first time they had a physical altercation. Holderness told the Daily Mail that he punched her in the face. After delivering his account to senior White House staffers on Wednesday morning many of them encouraged Porter "to stay and fight," according to the source. Imagine how many people's lives are being ruined by such allegations! Some are true and some are false, and it's so hard to tell the difference! Thank goodness we have people in the White House who understand how important it is to assess these things properly! Doors and vases are dangerous objects, especially to women!